The Knight's Riding Cape is a sleek and attractive cape that features rugged design elements, making it the perfect cape for any knight or warrior to wear. The cape is made from 100% woven cotton and is an absolutely astonishing accessory. Made from woven cotton, this cape does more than just act as a cool accessory. It can also act as a second layer, providing additional insulation to your medieval or renaissance look during the cold months. 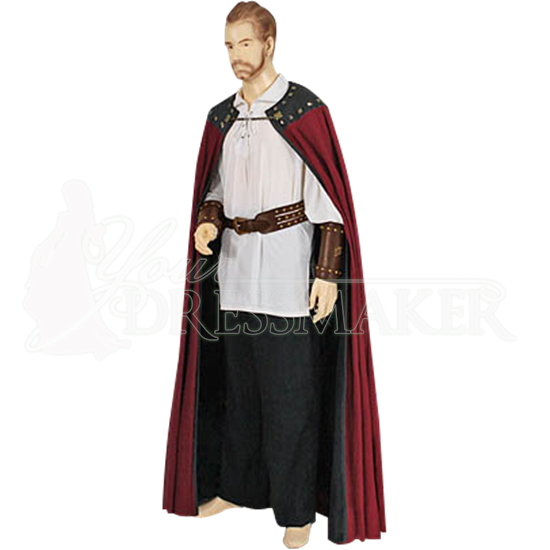 This cape also features a real suede leather collar and is fully-lined with Muslin cotton. The cape is available in several different colors and sizes. 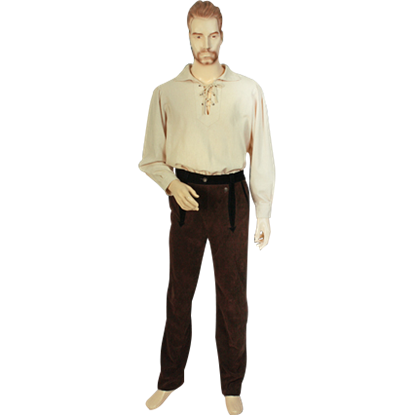 The cape pictured above is shown with a belt, arm bracers, a shirt, and pants. Please note that none of these items are included with the cape. 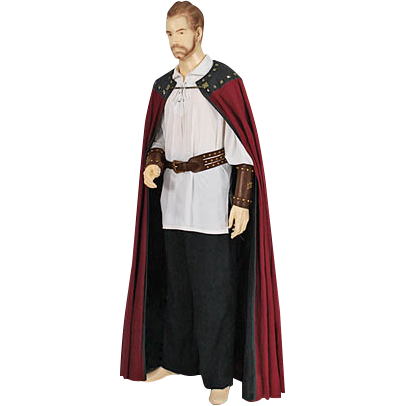 If you feel like your medieval or renaissance look is missing something, then perhaps you should consider adding a rugged and reliable cape like the Knight's Riding Cape. It compliments several different looks quite nicely. When ordering, the first Color dropdown menu is for the main color of the cape. The Accent Color is for the suede leather that is around the shoulders. Despite a few small problems I am still quite satisfied with this cape. It's got a great weight and warmth to it, is comfortable, and is great looking. The cons though: the metal decorations around the collar have a tendency to come loose. Also the clasp is too light-duty for it, and in my case it actually broke within just the first few minutes while trying it on. It was easy and cheap to replace though, so I consider it only a minor problem. The buyer should however be aware of this possibility. Even without the metal accessories though, I'd still say that this cape is worth the price.